As anyone following me on facebook already knows. Roberta and I decided on a cold and rainly Saturday to take Molly and Nora up to the gunrange in Watsonville and teach them how to shoot. For their first time shooting they did pretty good. We rented a .22 caliber revolver and a a .22 caliber semi-automatic. 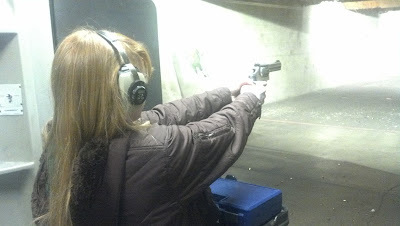 Roberta taught Nora the revolver and Molly and I used the semi-auto. After a box of 50 rounds each we swapped kiddo’s. An interesting thing happened. Molly did pretty good, consitently hitting the target and getting comfortable with shooting. She had a lot of fun. Nora on the other hand was flat out scary good. 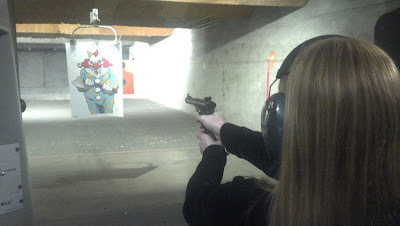 In the picture above you can see she’s shooting at an evil clown. (-: We started with typical round targets but got the clown targets so they could have some fun. Anyhow, Nora’s first 4 rounds went into the top button, all in the circle, second 4 rounds in the nose, all 4 on target. It took her 2 shots to take out the right eye and 3 for her to take out the left eye. One more round each into the other two buttons, 3 in the right hand (one miss just below), 3 in the left hand, and one to break the axe handle, low center on the stick. All this on her first time shooting and at about 20 feet away (as you can see in the picture). Like I said, scary good. If anyone needs proof the evil clown and her other targets are now mounted proudly on her bedroom wall. I think we’ve created a monster. She wants to know when we can go back. We also let them shoot the .40 Caliber Smith and Wesson that we bought Roberta for Valentines day when we lived up in Alaska. We put a single round in the magazine and let them shoot at a round target. They each did this a couple of times but preffered the .22’s. A lot less kick and a lot less noisy. But we wanted them to shoot it at least a couple of times so they would at least know they could. You shoot a CLOWN? Was it me???? ?